Conversion of person’s morphology atlas to geometric form makes it possible to diagnose the object in real time based on a video, a photograph, handwriting, initials, etc. Furthermore, it is possible to know all histology without performing tissue section, punctures, etc. The method makes it possible on the principle basis to determine body’s dangerous states, to remotely control vital activity and the possibilities of resto­ring it in certain cases. Also, any object is converted to geometric form by means of digital processing of knowledge of the state of oil pipelines, wells, and of knowledge of natural and anthropogenic catastrophes. Also diagnosed are malfunctions and deviations from operational specifications of machines in past, present and future time. 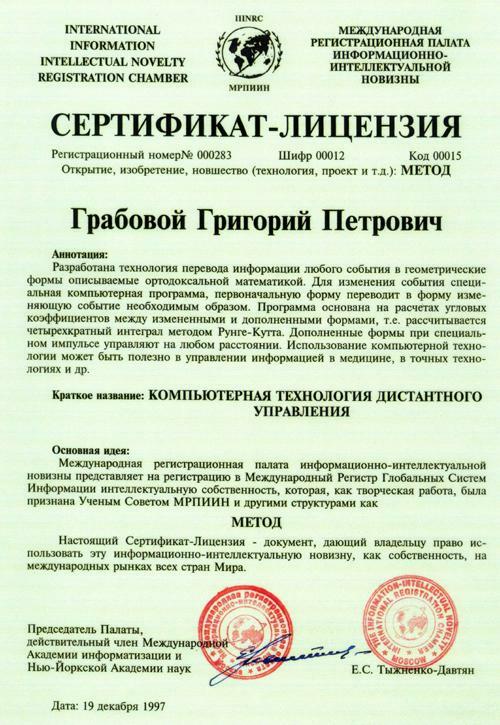 This Certificate-License is a document granting the holder the right to use this informational-intellec­tual novelty as a property in the international markets of all the World countries. 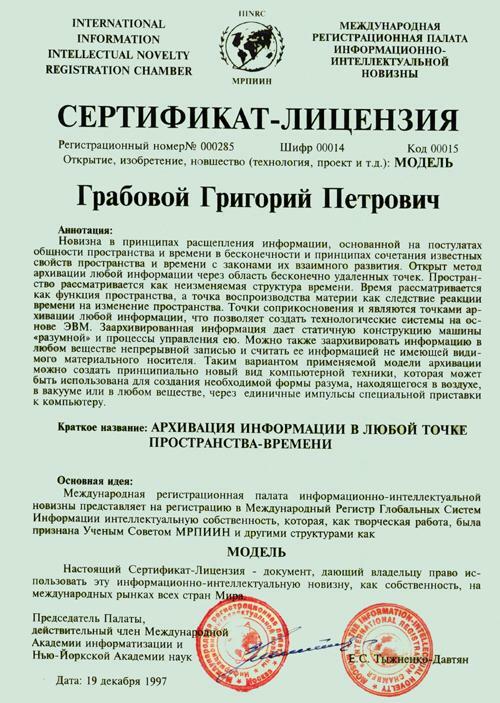 Procedure of transferring the information of any event into geometrical form described by orthodox mathematics has been developed. To change an event a special computer program transfers the initial form into the form that changes the event in a required way. The program is based on the calculations of angular coefficients between the changed and added forms, i.e. a four-fold integral is calculated by the Runge-Kutt method. Added forms, given a special pulse, perform control at any distance. The use of computer technology may be helpful in the control of information in medicine, in high technologies and others. 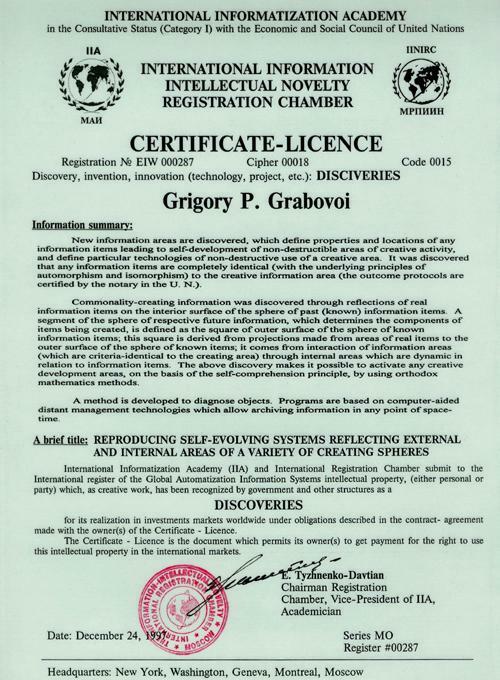 The present Certificate-License is a document that entitles the owner to use this information- intellectual novelty as a property in international markets of all countries of the world. The novelty is in the principles of splitting the information based on the postulates of space and time common character in infinity and on the principles of combination of the known properties of space and time and the laws of their mutual development. A method of filing any information through the field of infinite points is diecovered. Space is regarded as an immutable structure of time. Time is considered as a function of space, and the point of reproduction of matter – as a consequence of time response to the change of space. These are contact points that are the points of filing of any information, and this makes it possible to create computer-based technological systems. The filed information provides a static design of “intelligent” machine and processes of its control. Information can also be filed in any matter with the use of an interrupted entry and regard it as information having no visible material carrier. This version of the applicable model of the filing may be used for a fundamentally new kind of computer technology that may be used for creating a required form of intelligence located in the air, vacuum or in any matter, through individual pulses of a special adapter to a computer. New fields of information are proposed determining the properties and places of location of any objects of information that cause self-development of non-destructive fields of creation, also determining concrete technologies of the non-destructive use of a creation field. Complete identity (on the principle of automorphism, isomorphism) of any objects of information is discovered with respect to the creating field of information (protocols of the results have been notarially attested in the UN). The discovery of the creating field of information was realized through the representation of information objects being realized on the internal surface of the sphere of the past (known) information objects. A segment of the sphere corresponding to future information that determines the components of objects being created, is found as the area of the external surface of the sphere of known information objects, this surface being determined from the projections of the fields of objects being realized to the external surface of the sphere of known objects and arises from the interaction of the information fields that are criterionally identical with respect to the creating field, through the internal fields of spheres that are dynamic with respect to the objects of realization. The discovery makes it possible to realize any directions of creative development based on the principle of self-comprehension with the use of the method of orthodox mathematics. A property of matter is discovered that makes it possible to receive practically immediately a necessary form on the basis of a single program incorporated to some interval of time (proof certified by a protocol is available). Computer technologies make it possible to ensure control of matter, recovery of organism tissues and its safety, control over machines, creation of matter by the principle of transferring the time to any matter – a principle of non-destructiveness of the time structure under changes in space; source of energy from the time of past events is unlimited, i.e. any event of the past can be split up by an infinite quantity of methods including also the method of a feedback – control of the time of future events. Actually, when using an applied apparatus on a conceptual basis, the time of past events can be used. Consequently, in the author’s opinion, any matter may be recovered from the set of “random” events in any time interval, and this means the illogicality of any destruction. New information areas are discovered, which define properties and locations of any information items leading to self-development of non-destructible areas of creative activity, and define particular technologies of non-destructive use of a creative area. It was discovered that any information items are completely identical (•with the underlying; principles of automorphism and isomorphism) to the creative information area the outcome protocols are certified by the notary in the U. N.). Commonality-creating information was discovered through reflections of real information items on the interior surface of the sphere of past (known) information items. A segment of the sphere of respective fixture information, which determines the components of items being created, is defined as the square of outer surface of the sphere of known information items; this square is derived from projections made from areas of real items to the outer surface of the sphere of known items; it comes from interaction of information areas (which are criteria-identical to the creating area) through internal areas -which are dynamic in relation to information items. The above discovery makes it possible to activate any creative development areas, on the basis of the self-comprehension principle, by using orthodox mathematics methods. 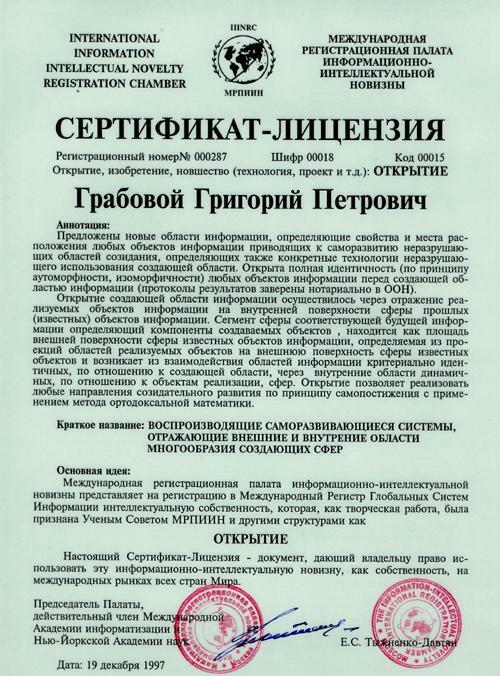 for its realization in investments markets worldwide under obligations described in the contract- agreement made with the owner(s) of the Certificate – Licence. 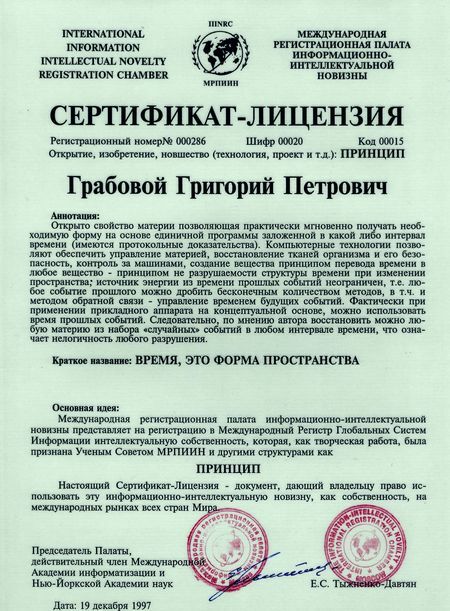 The Certificate – Licence is the document which permits its owner(s) to get payment for the right to use this intellectual property in the international markets.